• Application controls and uses only basic features of more advanced accessories. HomeKit's rollout hasn't been as fast as one would expect for a company with Apple's clout. First, HomeKit certified devices were slow to make it to market. Since 2015, I've reviewed only two HomeKit compatible products, the Insteon Hub Pro - a hub that bridges between Insteon networks and HomeKit devices and iHome's ISP5 SmartPlug - a simple HomeKit certified "smart" outlet. The other stumbling block for HomeKit was the absence of a unifying HomeKit app from Apple. If you installed hardware from more than one manufacturer, you were stuck using each manufacturer's app to control the product. This was demonstrated in my recent review of three HomeKit Smart Plugs with power monitoring capabilities. That review was written using an iOS 9.3.5 iPad and relied on the applications supplied for each device. But HomeKit finally appears to have matured enough for Apple to make it a key feature in iOS 10. The new Home app claims to eliminate the need for third party apps by providing full-featured control of all HomeKit certified products. Since many of the features across the products are common to the HomeKit Platform, before delving into the individual products, let's take a look at general Pros and Cons of the HomeKit platform. I will attempt to install all devices using the Home app and test the features of the devices to see if the Home app really can be the one to rule them all. Setting up new HomeKit accessories using the Home app is very simple. Just tap the "+" key in the upper right corner and select Add Accessory. A discovery screen will appear and find any unconfigured HomeKit devices. Then select the device you want to add. You may be prompted to allow the device to connect to your Wi-Fi network. Next, you either manually enter the eight digit HomeKit code, or use the camera on your iOS device to scan the number from a label that's included with the product. 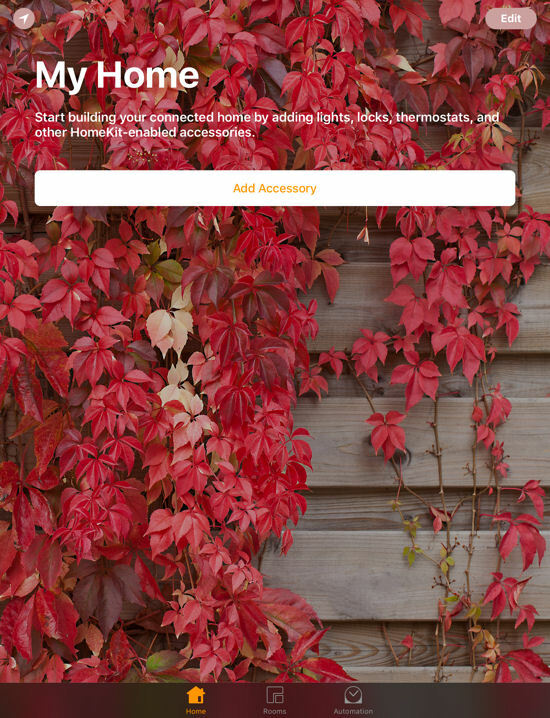 An "Add Accessory" screen lets you rename the accessory, place the accessory in a room, define the accessory type, and include the accessory as a favorite on your home page. The process is virtually identical for all HomeKit accessories. It takes longer to remove a HomeKit device from its packaging than to configure it. Though setup involves just a few steps, I've included a short gallery below to show how it looks. Remember, the process is the same for most products. You may have noticed I said "most products". Of the seven products I attempted to install, five of them installed using the Apple Home app. For the Philips product, since it had a hub that needed to be configured separately, I first set up the hub, allowed it to update its firmware, then discover the two lightbulbs. Once the hub and lights were working within the Philips app, Apple Home discovered the Philips Hub as a HomeKit accessory as well as its two connected light bulbs. I attempted to install the Elgato eve room accessory but ran into a hitch. The Apple Home app found the device and successfully paired it, but then jumped to the red screen below. While it added the device to the Home screen the icon showed "Unknown, Not Supported". After upgrading the firmware using the Elgato Eve app, the three sensors in eve room accessory (temperature, humidity, and air quality) each appeared as separate read-only icons.